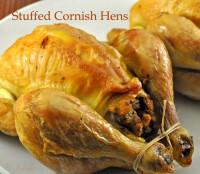 Stuffed Cornish Hens, those were the days, my friends…..
We don’t actually have Cornish Game Hens here. We have little chickens: coquillettes, poussin…. They’re about the same size as Cornish hens but I have no idea of their background. I have a long, colorful history with Cornish hens, but more of that later. When you are hungry for turkey and stuffing but want something a little more manageable try stuffing these little birds. They can also make an elegant main course for a festive dinner party…. Just remember finger bowls. Sauté onion, celery and sausage until onion is tender and sausage cooked through. Put into a bowl along with paprika, herbs and bread. Mix well. Add enough stock to moisten it lightly but don’t make it soggy. Add egg and mix lightly. Mix the butter and mustard. Loosen skin across top of birds by pinching gently. With your finger tips rub butter mixture over the birds under the skin, covering as much of the surface as you can. Spoon the stuffing inside the cavity of each bird, filling about 3/4 full, and tie legs together. If all the stuffing doesn’t fit, bake it separately for 20 – 30 minutes. Twist wings around and tuck under backs. Put birds on a rack in a roasting pan and into a 400F (200C) degree oven for 15 minutes. Reduce heat to 350F (175C) and roast for 35 – 45 minutes longer. Baste birds every 15 minutes alternating between stock and wine. Transfer drippings to a saucepan, along with any remaining wine and stock. Heat to boiling, then add cornstarch mixture, stirring until thickened. Remove stuffing and place each bird and it’s stuffing on a plate and serve, gravy on the side. I was first introduced to Cornish Game Hens in college. It all started one day at church…. Or, maybe it was one night at the bar. It was after a nice cup of tea…..
Or, maybe it was a few beers. Whatever, my friend and I were talking to a couple of guys…..
We were complaining about the awful cafeteria food we were forced to eat. They were complaining about having to clean the dump they lived in. They rented half of a quonset hut. Really….. Half of a quonset hut. Anyway, a plan was hatched: They would provide food and beer and wine. We would clean their hovel, cook and eat the food, drink the beer and wine. By a strange twist of fate, the mother of one of the guys provided an endless supply of defective Cornish Game hens. They were missing a wing or part of a leg…. nothing serious but they were no longer suitable for sale. Every Sunday night for the better part of our first year in college, we feasted on Cornish Game Hens and whatever other trimmings the guy’s mother sent along with them. And we might have had a few beers…… Maybe a glass of wine, or two. Oh, and we spent a whopping 30 minutes cleaning (Mom did the laundry). We were all very happy with the arrangement – and my friend and I became pretty decent cooks. Sounds like a fantastic college experience for all. Wish I had a little chicken like one of these tonight. We like Cornish hens, too. 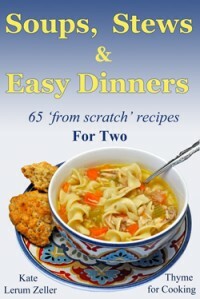 One feeds us both and, as you said, they make an easy but elegant main course for a dinner party. Tanna, ah, yes.. The good old days… When I leave the hubs home alone I stock the freezer with these…. Keeps him happy. Zoomie, one would feed us both – but then the hubs wouldn’t get the leftovers for his sandwiches…..